1,000 Samsung Galaxy S III NFC phones equipped with a Visa mobile payments app are being distributed to “key stakeholders and decision makers” for the London 2012 Olympics, where all points of sale will be equipped to handle contactless payments — and NFC World has been testing out one of the limited edition devices. 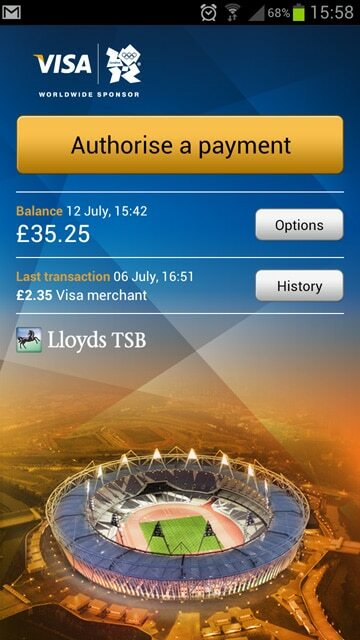 SLICK: Visa’s NFC payments app is a pleasure to use on Samsung’s Galaxy S III. Click to enlarge. Visa and Samsung, both worldwide Olympics sponsors, first announced plans to distribute an NFC phone for London 2012 in March 2011. All points of sale at the London Games will be equipped to accept Visa PayWave contactless payments and the idea is that distribution of NFC phones to VIPs will act as a catalyst for the wider adoption of NFC and contactless services. The first of 1,000 Samsung Galaxy S III NFC phones equipped with a Visa payments app are now being distributed to key stakeholders and decision makers for use during the Olympics and NFC World has been provided with one by Visa Europe so we can take a closer look over the coming weeks. Our first impressions are that the app is clutter-free and easy to navigate — and the S III with its stunningly bright and vivid 4.8-inch Amoled screen, speedy quad-core processor and the easy to navigate ‘TouchWiz Nature’ skin on top of Android 4.0 is a great showcase for the Visa app. For the Olympics, the device is set up to work with a Giesecke & Devrient SIM containing an NFC secure element. This is issued by Telefonica O2, which announced last week that it had partnered with Visa for its NFC payments rollout in Europe. The SIM stores a Lloyds TSB prepaid card account which came with a £50 (US$77) starter credit. As part of the set-up this is linked to an existing Visa credit or debit card account held by the user so that the prepaid account can be topped up with new funds as required. Set up took ten minutes and allowed the user to select whether payment will be automatic for small amounts or if they wish to enter a PIN for every transaction. The app displays the current balance on the prepaid account as well as details of recent transactions. If the merchant’s POS terminal has been programmed to display their name on receipts then the merchant’s name will appear for each transaction. If not, the phone’s log will simply say “Visa merchant” — but users can then tap on the transaction in the app to add the merchant’s details. A description of what was bought can also be added by the user to each transaction record. Payments can be made with the app open or closed. If the app is open when you pay, a screen prompt informs the user that the payment has been accepted or requests that the user checks the terminal for confirmation. If the app is closed and screen locked, that information is displayed the next time the app is opened. Payments can also be made when the phone is off although, Visa says, this is only possible for “a few hours” after the phone has been switched off. For the Olympics the app is Visa branded but, in a commercial environment, it would be branded by a Visa card issuer. We’ll be taking the S III with us to the Olympic Park to test out the phone (and watch some gymnastics, courtesy of Visa) during the games and report back then with more information on how the service works in practice. What is the app called? Is it available on Android?